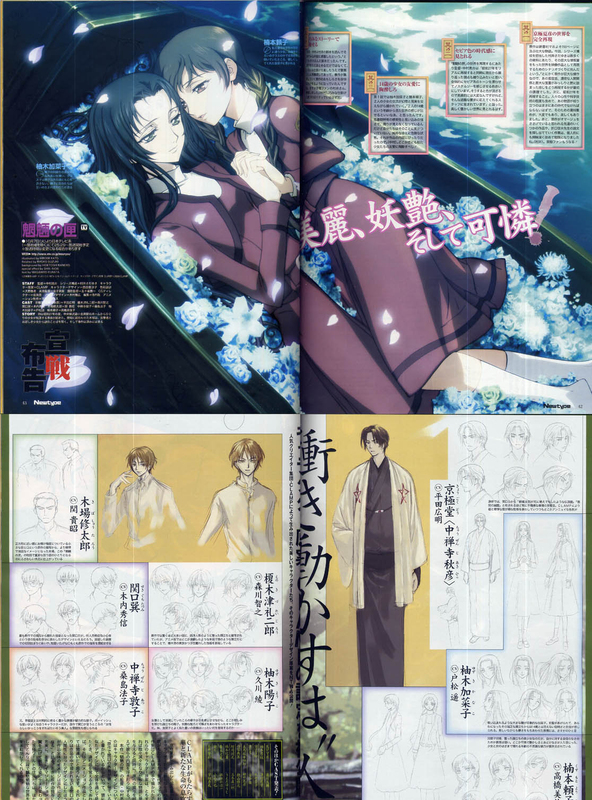 AnimeAnime reports that the first DVD of Mouryou no Hako will be released on December 21 by VAP. The DVD will contain the first two episodes of the series. The article also reports that the release will be followed by four monthly consecutive releases, making it a total of 5 DVDs. Unfortunately, there is no mention so far of any CLAMP goodies (such as booklets featuring original character sketches or a drawn Box). There are plans for a Blu-Ray Box release in April, 2009. With only 5 DVDs, I wonder how many episodes Mouryou no Hako will have. Maybe only 13? Speaking of DVDs and anime with character design by CLAMP, Bandai Visual announced that the Code Geass series broke the million mark of DVDs and Blu-Ray discs sold. In the official press release, Bandai Visual credits such success thanks to the anime popularity and the many extras that came with the DVDs and Blu-Ray discs, including the Box drawn by CLAMP. Mouryou no Hako premiered today in Japan, and you can get the raw of the first episode here. The anime has character design concepts made by CLAMP. I’m not going to make weekly posts when new episodes for this series are out. So if you’re interested in it, you can search weekly for raws and subbed versions via TokyoTosho. I watched the first episode and my first impression was very positive, I still must check the subbed version when it’s released to get familiar with the story, but I really enjoyed the atmosphere and mood, and CLAMP’s design in Madhouse’s animation is always so nice to see (but I do think the two girls’ hair look a bit weird xD). Great, great animation. As expected, the official website of Mouryou no Hako, anime adaptation of Kyougoku Natsuhiko’s novel with character concept by CLAMP, has been officially launched today. Click on the image to go to the website. Mouryou no Hako premieres on October 7 on Nippon TV.